Seasonal Occurrence: Common fall through spring. Less common in summer. Notes: The American Bittern is a medium-sized thickset wading heron. They are primarily buff brown with distinctive white streaks on the underside and sides of the neck. Their intricate wing coloration makes them fairly camouflaged when trying to spot them alongside marsh vegetation. While in flight they can be easily identified by their contrasting dark outer wing tips. Unlike most herons, the American Bittern has shorter legs, a relatively thick neck and long bill. This extensive thick and sharp bill make them distinguishable from similar herons such as the night-herons. When feeling threatened the American Bitten typically freezes rather than flying off. At the same time they extend their neck and bill to match the upright, swaying of marsh grasses. They breed in northern North American and Canadian marshes. Freshwater marshes are favored, but they can be found in brackish marshes and during migration they can even be seen in salt marshes. Although the Bittern is rarely seen, it is often located on the breeding grounds by its odd pumping or booming sound heard during the evening and into night. 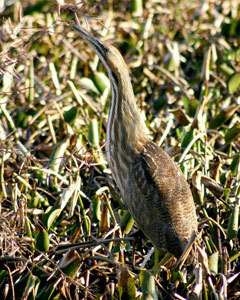 The sound produced by the American Bittern is heard during male courtship displays or when defending his nesting territory. During courtship the male makes this booming sound after he arches his back allowing white plumage to be visible while shortening his neck and pushing his breast out. Their sound will often carry long distances through the marsh. 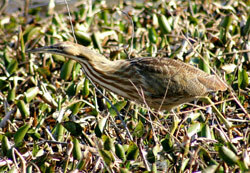 A beloved colloquial name for the American Bittern is the slough pump.